Are you low on cash but still want to party like a baller? Well, we’re here to help. Welcome to $30 Dinner Party, Thrillist’s brand-new series created to help people just like you throw killer dinner parties for very little money. Join host Lee Kalpakis as she creates special recipes for you to wow your friends and family on the cheap with new episodes every Monday at 2pm ET on Thrillist’s YouTube channel. Just because you're throwing a dinner party for a group of friends doesn't mean you're required to please everyone, according to their various tastes. After all, you're doing all the work by planning, shopping, and cooking and they're getting free food without lifting a finger. However, there are plenty of meals that make it possible -- or damn-near close to possible -- to please everyone at the table without driving yourself insane. We'll show you how. In the latest episode of Thrillist's new series, $30 Dinner Party, host Lee Kalpakis heads to the East Village to meet up with guest, Dania Hammad, who has a reputation among her friends for never cooking due to her demanding TV production job. She wants to blow her friends' minds by making a crowd-pleasing meal entirely from scratch and throwing a surprise dinner party for them at her apartment. Her task comes with just three requirements: the meal has to be shareable, vegetarian to accommodate one of her roommates, and cost under $30. 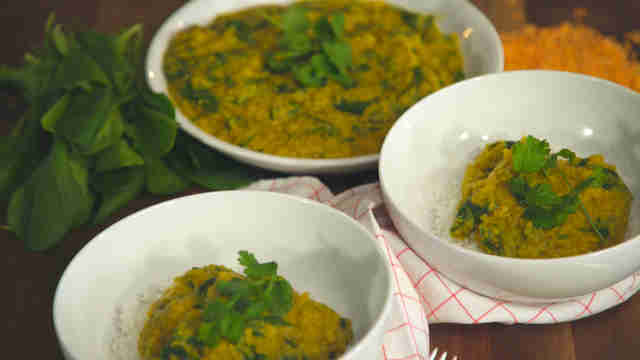 Lee knows just what to make to please everyone at the table: an Indian-inspired meal of eggplant curry, lentils with spinach and turmeric topped with cilantro chutney, and some "non-naan," which you'll understand once you see the recipe. Watch as Lee and Dania plan out the whole meal, shop for all of the ingredients, cook each dish step-by-step, and serve everything to rave reviews from her thoroughly impress friends. On top of that, all of the food cost well under 30 bucks -- $23.38, to be exact. Lee and Dania not only proved to her friends that she can indeed cook, but they also proved you can make a satisfying meal that everyone can enjoy on a tiny budget. You can do it, too. Preheat oven to broil. Line a baking sheet with foil. Using a paring knife, puncture the eggplant a few times on every side. Place the eggplant on the lined baking sheet and broil for 10 minutes, flipping halfway through, or until eggplant is very soft. Let cool to room temperature, then remove skin -- as much as possible -- and cut eggplant into pieces. Set aside until ready to use. In a large, heavy-bottomed skillet over medium heat add all the spices. Toast for 30 seconds, or until they become fragrant. Pour in 2 tablespoons oil and stir to create a paste with the spices. Add the remaining oil and once it is hot, add the onion. Saute until the onion is translucent and softened, about 2-3 minutes. Stir in garlic and ginger. Season with salt. Cook for another minute until very fragrant. Add tomatoes and cook until they are broken down completely. Stir in eggplant and peas. Cook until warmed and season with salt. Sprinkle with chopped cilantro to garnish. In a large Dutch oven or saucepan over medium-high heat, heat oil, then add garlic, ginger, and spices. Cook until fragrant. Add lentils and toast slightly. Pour in 6 cups of water. Bring to a simmer and cook, partially covered, but stirring occasionally, until tender and water is mostly absorbed, about 15 to 17 minutes. Stir in spinach until wilted. Sprinkle with chopped cilantro. Serve hot with rice. Roughly chop cilantro leaves. Add cilantro and remaining ingredients to a blender. Blend until smooth. Season with salt and pepper to taste. In a large bowl, whisk together flour, baking soda, and salt. Create a well in the center of the bowl. Add yogurt and oil into the well. With a fork, whisk the flour into the yogurt and oil until it is all incorporated. Add water a tablespoon at a time if it is too dry. Keep mixing until the dough is smooth and firm. Place a damp towel over the dough and let it rest for 10 to 15 minutes. Meanwhile, heat a griddle or a cast iron pan to medium high. Divide dough into 3 equal-sized balls. Using your hands, stretch and flatten the balls into flat oblong disks, dusting with flour if necessary. Keep other balls under the towel until you are ready to use, so they don't dry out. Press the minced garlic into the flattened dough. Put the dough onto a hot griddle, garlic side up. Cover completely with a lid and cook for about 1 minute. 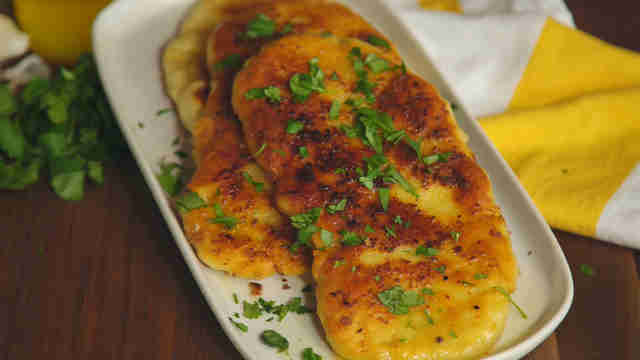 Drizzle with melted butter or ghee and flip. Cook for 30 more seconds, then drizzle with more butter. Repeat with remaining dough. Keep warm in a low oven until ready to serve. Do you live in the NYC area and want to throw a killer dinner party but don’t think you can afford it? Well, let us help you out! We’re looking for our next guest to be featured in $30 Dinner Party. Our host will create special recipes for you to wow your friends and family at an ultimate dinner party. If you’re interested in being a featured guest on the show, email casting@thrillist.com with your story! Tony Merevick is Senior News Editor at Thrillist and wants to throw a dinner party with a wine pairing for each course. Send news tips to news@thrillist.com and follow him on Twitter @tonymerevick.